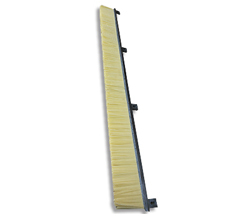 Strip Brushes perform a multitude of functions in a production environment. 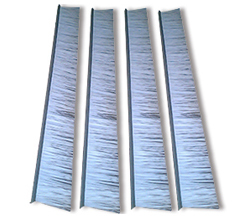 Strip brushes feature a formable metal structural element, the channel base, and brush fill that can be varied as to material type, trim length, density, and flexibility. The cut of the brushes to an individually required strip length or trim, as well as the additional drilling of holes in the extrusions is all part of our service. On request we can supply the backing in stainless steel and as fill material all common synthetic filaments, wires and natural fibres are possible. To choose the right fill material for your individual application, please see the overview of filaments and properties. 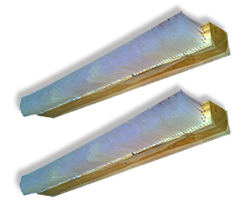 Brush India manufactures Strip brush in a variety of channel sizes and material offerings. Strip brush fill materials include synthetic, abrasive nylon, natural bristle and wire. 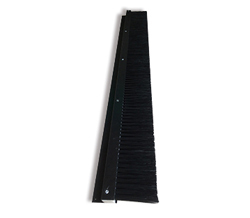 Staples set strip brush can be made to any length from 30mm to 3500mm. Can be made with Choice of Various Fill material like Nylon, PP, Steel, hair, etc. Prevents air and dirt contamination. Seal around a lever or control arm. Conveyor belt seals/guides to keep material on the conveyor. Strips to reduce or eliminate static build-up. Act as a stationary spreader or blade to move material. Splash guards or curtains on equipment. Cable guides or cable ways on furniture or electrical cabinets.